Ryan is officially on block leave! For those unrelated to military happenings, that means that Spencer and I have him for a whole two weeks before he even has to think about work again, and we’re loving it. Honestly, I’m also loving that he finally gets a break. This man’s been non-stop moving, working, stressing and getting into the groove of his new job at Fort Drum since we arrived in January. To celebrate leave, his company had Org Day on Friday, and we all got together to celebrate summer and having our loved ones for a break. 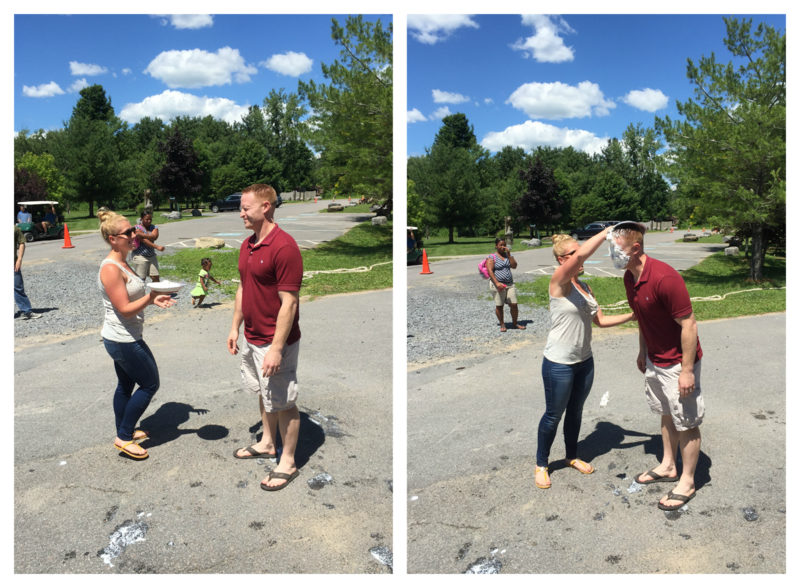 Oh yeah, and the FRG threw a pie-in-the-face fundraising contest. Soldiers (and family) got to bid on the pie in the face, and very few people were bidding on my husband. (I guess that means they like him?) Anyway, I bid $20, won, and smashed a pie in his face. It was glorious. We also got to explore a little more of Fort Drum, and we discovered that there are legitimate cottages and campgrounds on post by Remington Pond where the party was held. I smell a pseudo-vacation at some point soon. Mostly because that boy is getting too darn big, and we need to document it before he’s in college. Seriously. Time flies.